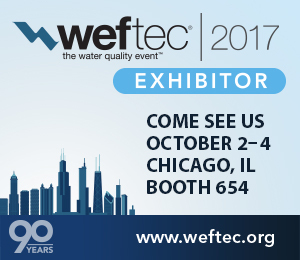 weftec 2017, visit us at booth 654. - Aquarius Technologies, LLC. weftec 2017, visit us at booth 654. Weftec 2017 is fast approaching and we are looking forward to seeing all of you at the show. Visit us at Booth #654 to discover how you can get 80% less biological sludge generated compared to conventional treatment technologies. Celebrating 90 Years of WEFTEC. The Water Environment Federation (WEF), is the not-for-profit organization that brings you WEFTEC. We understand competition for your time is fierce. We look forward to talking with you about Performance – Quality – Reliability and Service for your next Quantaer™ Fine Bubble Aeration System or Nebula™ MultiStage Biofilm System. The Solution is Simple.